They come in assorted colors and are about 1 1/2 inches in diameter and consist of tinsel and yarn woven very tightly together into a ball. They are very light weight. The colors are Blue, Red, Green, White, Gold and Dark Pink. The Kats'N Us cats field test all our cat toys before we offer them to you. No matter what we introduce to them, they always come back to playing with this toy. Our new addition to the Kats'N Us cat family loves to play with this toy and then brings it to us, places it by our shoes or his food dish in exchange for treats. One of my 3 cats is obsessed with these sparkly balls, I brought some in a shop in my home of the UK, but now I couldn't find them no longer, after finding them on here. I quickly ordered them, and now I literally have to bribe my cat in order to put his toys away when it's time for bed!!! My cat loves these balls. The only draw back is the tinsel that is left on the rug. But it's worth it, she LOVES them. My 4 month kitten is soooo active with these balls, I can't even explain. She likes that they're quiet and easy to fling and grab. The only down side that I'm constantly going under the couch or stove, etc. to reclaim them which is why I got the 25 pack. The kitten is a way-better fetcher than my westie and the fun starts at the crack of dawn and goes as long as I have time for. Occasionally I do find a strand of loose tinsel, so I'm not sure if any gets eaten or not. Cat is obsessed with these!! Better than the ones from the local pet store. My cat is in love with these, so I needed a stash. Super fast shipping and great product! 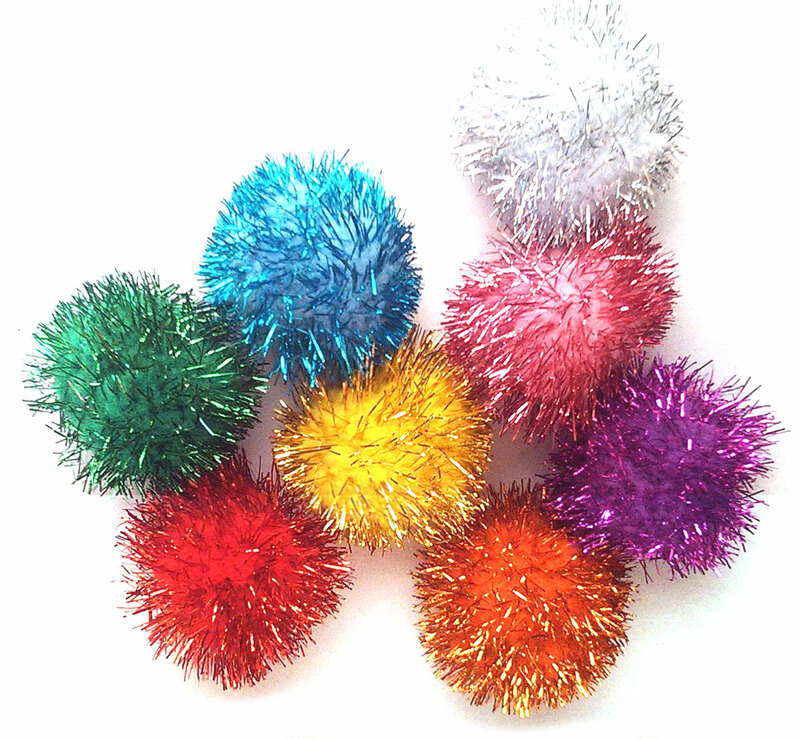 I purchased several other "sparkle balls" online for my cats and was disappointed. This is the closest to the "original" I can find. Customer service was prompt in answering my question on the product as well. My cats love these balls, it keeps them busy the whole day. It is the only toy they want to play with and seems to keep their interest. My kitten lovessss these, she runs around with them in her mouth and goes crazy chasing them around. Delivery was super fast and I really appreciated that they gave me one of every color (I bought 8) because I know that the color choice is random. They hold up quite well but I will definitely be buying more once she tears these up or my couch eats them! This is by far my cats favorite toy and the size is perfect so he doesn't swallow it. I used to buy them at the local pet store and it was costing me a fortune. KatsnUs not only has the best price, but it's great quality.